Story: Lane Quintana grew up in an impoverished village outside San Juan in Puerto Rico, where she was forced to live a life in petty crimes to survive . Her abilities, which she used for stealing, led her to work with a corrupt part of CIA for a short time. It ended on a mission in the jungle of Manigua where CIA was supporting a group of rebels trying to assassinate the president of Manigua. 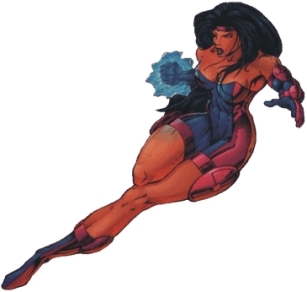 The plot was revealed by Morgan Stryker and his mercenaries and when Codename: Strykeforce was created shortly after the mission, Quintana joined the team using the codename Tempest . Tempest stayed with the team until it was disbanded by Stryker . During this time she became involved with her teammate Trace O'Donnel. This was revealed after his death . What happened to her after Strykeforce has not been revealed. Skills & abilities: Tempest has the ability to summon wind gusts strong enough to punch through a sixty-ton tank, or form a wall of wind strong enough to deflect an atomic explosion. Creating a wind vortex around herself, she can fly at speeds in excess of 1,200 miles per hour.